I selected the F-4E for one of two comparisons for a reason beside the fact that it represents the low end of aircraft data in hand: This is to be an Anti-(Not to be confused with ‘Counter’) Propaganda post. When I read a Golden-Armed Meat Servo quoted claiming the F-35 had 1950s ‘F-4 like’ turn performance based solely on the sustained turn spec change, I had to chuckle at the use of ‘misleading vividness’ and ‘damning with faint praise’ in reference to a comparison with the venerable F-4 . I wonder if such bluster was scripted for him by another meat-servo (generic) working in the Boeing Business Development Office? I wonder, because it is a good ‘hook’ of a sound bite for the ‘low-information’ public…but a pretty stupid one when you get down into details. The F-4E in our comparison isn’t a product of just the 1950s, But one of progressive improvement from the 1950s through the 1970s. The F-4 design was constantly tweaked throughout its operational life. It has been observed that the F-4 had seven different wings over its evolution through about 1980 if you count the test canard-equipped F-4 configuration (Bennett and Rouseau, 1980), and I believe the AF’s leading edge slat (LES) configuration was wing #4 or #5. The ultimate USAF F-4E dogfighter IMHO, was the ‘slat-bird’ with TISEO, a far different aircraft than even the Non-Slat F-4E configuration that my late Father-in-Law flew in Vietnam (or the non-slat F-4Es we in the 57th FIS were still flying out of Keflavik Iceland in the early 80’s). 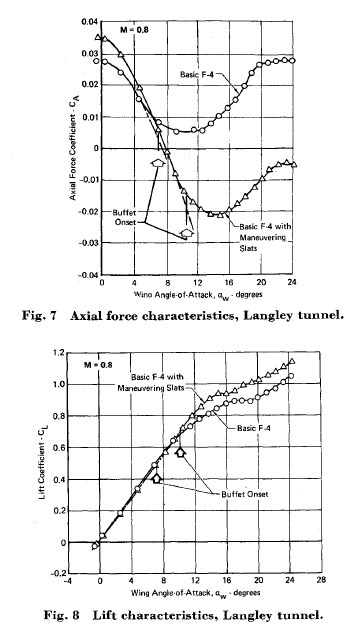 From "Determination of F-4 Aircraft Transonic Buffet Characteristics"; E. G. Hollingsworth, M. Cohen, Journal of Aircraft; Vol 8, No. 10; October 1971. Col Robin Olds smote “highly maneuverable” MiGs while flying comparatively less agile and capable F-4Ds. Think about what he could have done in a F-4E ‘Slat Bird’. From the charts above we find the basic aerodynamics of the late model F-4E are clearly ‘superior’ (even using our grading methods) to the 1950’s or 1960s F-4 image that still resides in most people’s minds. From history, we know that it was lethal when in capable hands against far more 'agile' aircraft of its day. Now we will take note of the specific weight and drag circumstances used for the F-4 in our comparison. The configuration of our F-4E (50% internal fuel, 2 AIM-9s and 2 AIM-7s, and a nose load of 20mm) closely describes a fighter that is either 1) on a short range point defense mission, 2) or has dropped its wing tanks a “half-internal fuel load” ago. Either way, it seems the F-4 we describe had better be on its way home or to a tanker pretty soon on ‘Mil’ power if it hopes to make it back to his base. The F4-E in our static ( i.e. “snapshot”) comparison has a sustained G turn rate slightly above the F-35A_H (Low) boundary configuration. How might that change if we lowered the F-35A_H fuel load to something comparable to the F-4E’s? By ‘comparable’ I do not mean ‘the same’, I mean a fuel load that will allow the F-35A_H to fly as long or far as an F-4. This "apples to apples" comparison can be reasonably estimated. While the F-4E in its modeled configuration is no doubt 'lightweight', it does have a slight but measurable sustained turn advantage compared to our representative F-35A_H(Low) but is at a greater disadvantage against the F-35A_H (High) boundary configuration. It must be remembered the later-generation fighters have tailored-airfoil wing designs developed using Computational Fluid Dynamics to wring as much efficiency as possible and with blended fuselage-wing profiles would be superior to a wing using a catalog airfoil or airfoils (In the case of the F-4, it uses a modified NACA 0006.4-64 airfoil at the wing root transitioning to a modified NACA 0003-64 airfoil at the tips, Source) The F-35A_H in our example now assumes a far higher fuel fraction of total weight in fuel is onboard than the F-4E example. What if we reduced the amount of fuel on the F-35 to be more operationally equivalent to the F-4E’s fuel load? We can adjust the fuel fraction of the F-35 by adjusting fuel carried (downward) to approximate the equivalent fuel of the F-4. What is important is to closely approximate the fuel on board the F-35 that is an ‘equivalent’ needed by the F-35. I’m going to avoid quantifying the ‘time element’ up front and use it later as a "punch line". In making the adjustments, let us give as much benefit of the doubt as possible to the F-4E example. Two of the biggest benefits of first building a ‘worst case’ scenario in parametric modeling for studies that I perform are 1) If a solution is an obvious one, even with everything ‘going against it’ it is easy to get even Management on board with the solution and 2) If the solution is an obvious one I don’t have to do any more excursions – it’s a great time saver. 1) We assume the F-4 has no higher drag/’total thrust’ ratio than the F-35A_H while maneuvering, though the F-4E is heavier and the overall F-4 design was originally optimized for intercepts at higher altitudes and supersonic speeds and has a less efficient (for maneuvering at lower altitudes) ‘catalog’ higher aspect-ratio wing (modified NACA 0006.4-64 at the wing root and NACA 0003-64 at the wingtip ). 2) The Specific Fuel Consumption (SFC: pounds of fuel per hour-pound of thrust) at all throttle settings is assumed to be equivalent between the two aircraft. Besides having a much older J79-17 engine design in the F-4E, there is no FADEC as in the F-35A_H. 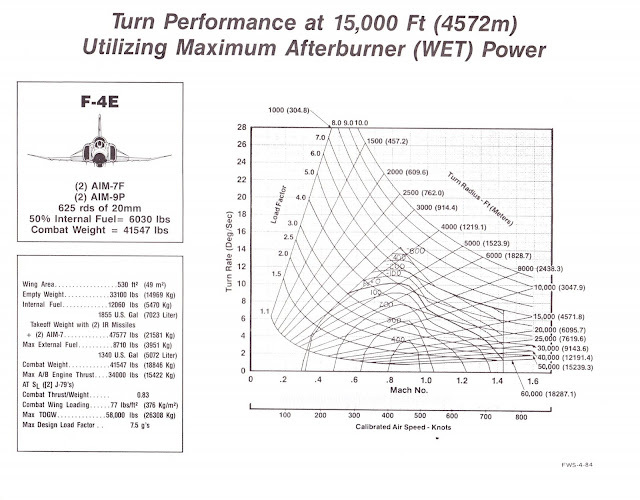 Though the J79 engines in the F-4 may have a very slightly lower SFC in afterburner than the F-35A_H’s F135 engine, they will have significantly higher SFC in Mil Power (Max throttle no Afterburner)—these are typical differences between turbojets and turbofan engines. 3) Since the F-35A_H has higher thrust-to-weight in Mil Power AND Afterburner and a much higher Mil Power/Afterburner ratio, the higher efficiency of the F135 is even more apparent, but we will ignore that higher efficiency in our analysis and call it ‘a draw’. 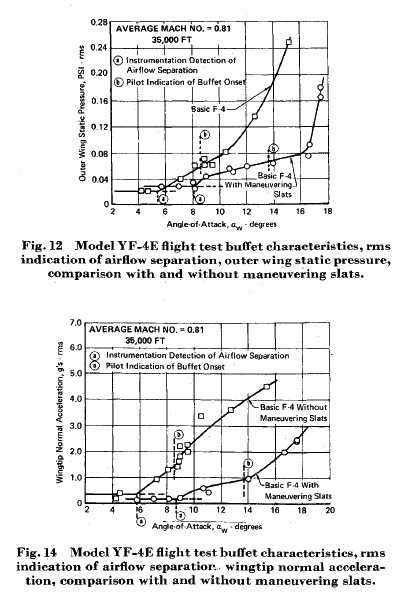 So if we assume the drag/total thrust ratio and fuel efficiency (SFC) are equivalent between the two aircraft, all we now have to do is account for the disparity in non-fuel weight and thrust ratings. The F-4s fuel fraction in this modeled configuration is about 14.5%. To get the same fuel fraction in the F-35A_H, we would reduce the fuel carried from about 11800 lbs to about 5120 lbs. But since we assume we need all that extra thrust in the F-35A_H to do the same amount of ‘work’ as the F-4E, we need to add enough fuel back into the F-35A_H to ensure it has the same relative endurance as the F-4E. The F-35A_H has slightly more than 26% more thrust than the F-43 (43000 lbs vs 34000 lbs), so we will increase our assumed F-35A_H fuel load by adding that same percentage to the intermediate 5120 lb value to arrive at an “F-4 equivalent” fuel load for the F-35A_H of 6474 lbs. Note that by using the higher 43K pounds of thrust figure vs. any lower thrust value, we are requiring our F-35A_H to carry more fuel than otherwise. Again, this is done to give the F-4E every possible benefit before deriving sustained G turn rates in our comparison. Our two contender’s configurations in this excursion are therefore as identified in the table below. 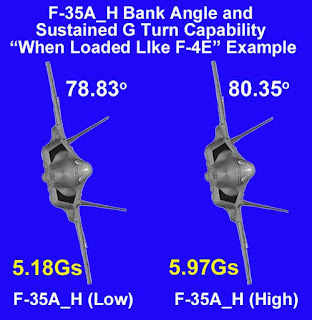 We can now use these numbers to derive the estimated changes to the range of possible “Sustained-G Turn” capability for the F-35A_H. The nice thing about 'sustained turns' for doing this kind of extrapolation is that we are dealing with states of equilibrium. We can take the 'g' load and multiply by the aircraft weight to arrive at the total Load Factor and equivalent lift required. At a lighter weight, the same lift and total load is achieved at a higher bank angle and the same load divided by the new lighter weight yields a higher g-rating. As the aircraft is still flying at same speed and altitude, which requires the same wing performance/ efficiencies which have the same drag effects in our region of operation. Use the figure from Part 1 (left) to visualize the force vector relationships and how they change as the weight is decreased. If the dark blue weight 'vector' is smaller, to get the same equivalent lift and load factor found at max turn and heavier weight, the bank angle is greater. The only assumption I am making in this case is that the Center of Gravity (CG) shift is not a factor. If the CG shifts forward or aft because of the weight difference, there may be some variation, but modern aircraft are designed to optimize the CG as fuel burns down, so this factor is ignored. 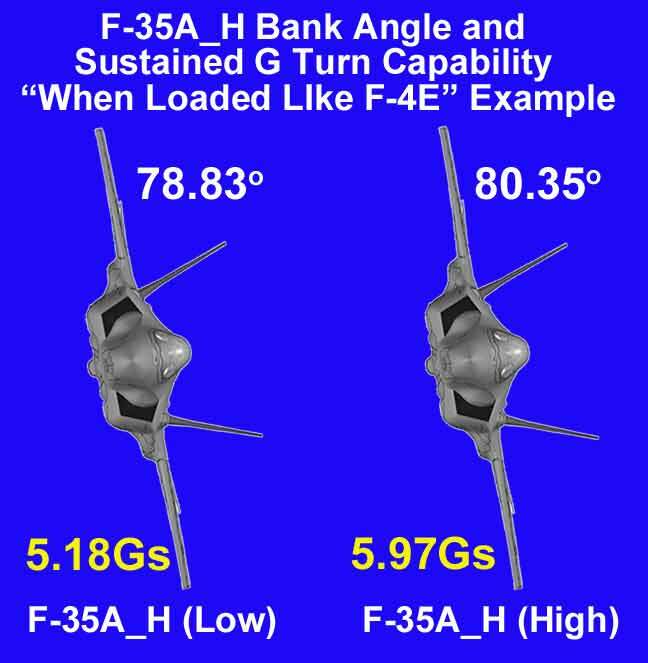 The F-35A_H Sustained turn bang angle and 'G' boundaries we used earlier for the higher weight assumption thus shift noticeably higher when the F-35A_H fuel load is reduced to something comparable to the modeled F-4E configuration. Dramatically When Aircraft is Loaded Comparable to the F-4E Configuration. F-35A_H Sustained Turn Rate Range at F-4E Equivalent Fuel Load. It should be obvious to even those most critical of the F-35 that I could have made a slew of small errors at the margins in this analysis and it wouldn’t have significantly changed the end result. When configured at “apples to apples” operating weights, the F-35A_H clearly outclasses the F-4E. We can say that at these configurations, the F-35A_H is "better" to "superior" in comparison to the F-4E. The F-35 airfoil efficiency is also not reduced by external stores in its ‘Day 1’ configuration. With its superior fuel load the F-35 can 1) pick and choose the time to engage, probably without the F-4 ever knowing it was there and 2) capitalize on its superior thrust/weight ratio and better controllability at higher angles of attack (AoAs) . In addition, if you refer to the E-M diagrams in the previous post and above, you will observe that the bleed rate ‘isobars’ for the F-4 in a turning condition are much closer together than for aircraft in later generations. I suspect the F-35’s E-M diagram looks much more similar to later generation fighters than the F-4’s. If we refer to the ‘Dash-1” flight manual for the F-4E and view the combat fuel consumption plots, we find several important bits of information. 1. The plots assume supersonic wing-level flight. 2. The plots show a range of fuel consumption: from minimum afterburner to maximum afterburner and for an ICAO ‘standard day’ as well as a 10 degree warmer day. 3. The plot for the closest configuration to the F-4E configuration we are using is the for 4 x AIM-7s instead of the 2 x AIM-7 and 2 x AIM-9. But that’s OK, because the AIM-7 carriage is lower drag than the AIM-9 on the F-4 (Pylons and launcher on wing vs. semi-conformal on fuselage) so we have another negative we ignore to give benefit to the F-4E in the comparison. 720 lbs/minute fuel burn rate and 6020 lbs of fuel on board = about 8 minutes 20 seconds before the F-4 crashes, hits a tanker, or lands. That’s assuming all the fuel on board is usable, though it is not. From this fact alone, it should be obvious to the reader that the F-4E configuration that could theoretically compete with an F-35 in a “sustained turn” competition was “infeasible”—an F-4E “strawman” that was good for highlighting that even with every advantage, and flying as light and slick as possible, the F-4 sustained turn rate doesn’t quite match up to more modern aircraft. I suspect that was the entire purpose of including it in the Fighter Weapon System Symposium materials in the first place: a benchmark to compare against the F-16 that was designed to make the F-16 ‘look good’. Next in Part 4: F-35A_H vs. the F-16A Sustained Turn Performance. What will we find? Brilliant! Keep up the good work. Concur, very good posts on the subject. The question about fuel fraction is particularly relevent in my view. AS the F-35 is designed to carry external drop tanks internally, it changes the idea of drag and T/W completely. I would have responded earlier, but I was incommunicado on a business trip. Thanks for the kind words and sticking with me on the series. Most people's eyes glaze over at the slightest hint of math. I think I'll close the series with the F-16A comparison and a summary wrapping up and going back to where it started with the 'E-M Backgrounder' post. As you have covered in other posts, manuvering performance is a complex set of dynamic factors. While the F-35 isn't a stellar performer in some respects, it is certainly better than some give it credit for. A few years ago, I did a simple comparison chart on fighter specs for a mainstream book on the F-35. I compared the 8-10 most popular fighters and based the W/L and T/W numbers on fuel fractions in a light A-A and heavy A-G configuration. No dramatic changes, but certainly tipped the scale in favor of the F-35 and Flanker which have similar large fuel fractions and better absorbs Heavy weapons due to it size. I'm about to wrap the next post up, and I'm seeing pretty much what you did. 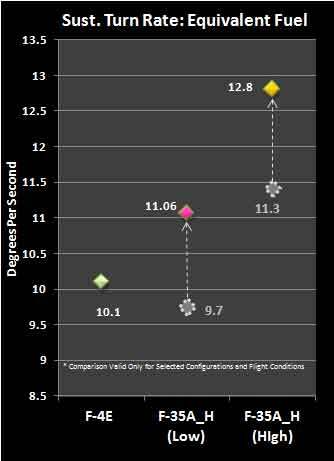 They may start out as slightly lower performers in the sustained turn category, but bigger planes handle payload variation with less adverse impact. It's all about weight fractions if you have enough power. While I'm not tackling T/W ratios, you can see the same for that category as well. After a couple of excursions where I lighten up the F-35, I'm doing one where I load up the F-16A with fuel to replicate what its condition would be on an intercept- right after dropping fuel tanks. Looking at the T/W ratios, I can see indications why some pilots flying the F-35 rate its 'kinematics' highly. I did some probing towards Lockheed for my book research at the time. Basic answer was that the F-35 has similar roll-performances as the F-16, and better instentaneous turn-rate. Which seems logical, as it can pull much more AOA. To me it indicates that the F-35 follows in the footsteps of the F-16, having good - if not very good - transient performances in the transonic regime. That is: to execute the shortest possible OODA-loop. And that's really before we start to take into account the sensors and SA. One of the statements made by the anti-JSF crowd (Kopp, Wheeler, etc) is that BVR missiles are "useless" and "ineffective" in aerial combat. On the AirPowerAustralia website, Kopp cites a 46% Pk figure for the AIM-120 AMRAAM. However, it appears that, in order to get this figure, Kopp and Goon excluded all successful non-BVR AMRAAM shots, excluded instances where more than one missile was fired at the target, and a successful interception was carried out, and deliberately included instances where pilots fired their missiles well outside of the AMRAAM's NEZ in order to achieve a mission kill, and intentionally not attempting to hit the target. So, would you say that the AMRAAM, and especially the new AIM-120D version, would be capable in an actual combat situation, and that Kopp and Goon are just skewing the data in this situation to "prove" the ineffectiveness of the F-35? Also, Kopp tends to talk a lot about how the AMRAAM would have its Pk reduced even further by DRFM (Digital Radio Frequency Memory; a kind of repeater jamming). However, I believe I've read something about how, because the new -120D AMRAAM has a two-way datalink, the F-35 pilot could use the DAS to determine which targets are "real" and which are created by repeater jamming (as returns produced by DRFM obviously don't have a thermal signature), and could use the datalink to "tell" the AMRAAM which return is the actual target. Have you heard anything to that effect? Obviously, a lot of information on the AIM-120 is classified, and air-to-air missiles might not be your area of specialty, but since you work/have worked in military programs and seem pretty knowledgeable about military matters, what is your opinion on the AMRAAM? The arguments being made today against the BVR missiles and engagements are exactly the same that were being made by essentially the same, with a few new protégés, faux 'Reformers' as in the 70s and 80s. They are just as false and without merit as they were the first time these ideologically driven, and militarily-challenged charlatans made them. I recommend you Google up "The Revolt of the Majors: How the Air Force Changed After Vietnam". It is the doctoral thesis (Auburn U)of a retired AF Colonel and AF Historian Marshall L. Michel III. It builds a very coherent picture (though with a surprising number of typos) of how training AND technology make the AF an effective fighting force. You could probably skip to near the end around Chapter 12 for some AMRAAM, BVR, and 'Reformer' perspective, but you would so yourself a disservice if you didn't read the whole (~450 pages) thing. I keep a copy for the references alone. I won't get into what AMRAAM capabilities might 'be' except to say that ALL missiles are designed to work in a dense electromagnetic environment. After all, who, if they knew anything about the technology involved, would suppose otherwise? There are textbooks on testing guided weapons that had sections devoted to the validation and verification of counter-counter-measures. So it is not as if the challenges are unknown or ignored, and I think it is pretty foolish of some to assume they are. While a missile might go into a box and then not be used for up to 10 years, most are returned to depots for repairs at one time of another. These missiles are not only upgraded with advertised 'block upgrades' or mods, but typically receive latest software updates as a matter of routine. Also the 'Vanishing Vendors' phenomenon occurs on all systems. This requires program offices to to find other suppliers to provide parts. When it comes to electronic components, that typically means more robustness and improved performance as well. The missile design does not stay static any more than the aircraft's. I checked out the paper you mentioned -- it is quite interesting. One of the statements I see coming from today's "reformers" seems to be that low-observability is "useless." According to the armchair generals on the Interwebz, "everything is observable below two GHz" and low-frequency radars have some kind of magic anti-stealth properties. Yes, it is true that low frequencies begin to produce half-wave resonance effects, but at the 0.5 GHz to 2.0 GHz range -- which is where all non-OTHR or "passive" low-frequency radars operate, the half-wave resonance effect is still relatively small -- even at 0.5 GHz, the half wavelength is a foot long, so only the very small leading edges of the aircraft will resonate -- and those leading edges are typically covered with radar-absorbent materials. It is commonly stated by the anti-JSF crowd that RAM doesn't work below 800 MHz, but it seems that the actual radar absorbing material isn't the only component of RAM. I found a pretty interesting document about how engineers at Lockheed found new components to add to RAM to improve its abilities against low-frequency radar. So it appears that the addition of other components to RAM can make it effective against C/D-band radars. So it seems that the only radars that can reliably defeat low-observable technology are extremely low-frequency VHF radars commonly used in OTH roles, where half-wave resonance affects the entire aircraft and even with supplementary materials, RAM is ineffective. However, with VHF radars, you have to deal with the fact that you only get a 2D image (so no altitude information, and thus no ability to fire a missile based off of a VHF track), the resolution is so poor that, at typical detection ranges, you only know where the aircraft is within several kilometers (or more! ), and the radar set is large and not particularly mobile (moving it is difficult, and some designs are completely immobile), so it is easy to attack it with, say, a missile fired from an SSGN. First off, let me compliment you on the incredible work and excellent analysis. However, something has occurred to me while reading the F-35 sustained turn rate articles. In the first part, you make the assumption to load all aircraft with 60% fuel. This is a very fair metric to start with, and great for making assumptions. But the F-35 was built to have the range of an F-16/18/AV-8B with drop tanks. So would it not make sense to try and account for this disparity? It would raise the F-35's turn radius by a bit, but likely not as much as the later comparison with an F-4 and F-35 loaded with the same amount of fuel. The idea being to give the most realistic picture possible. Here is what I've come up with. An F-16 loaded with 60% fuel is 4,200 lbs (assuming 7,000 lb total internal capacity). However, the capability to have 2x370 gal and a 300 gal fuel tank can raise it's total capacity to 14,000 lbs. Thus meaning it's only carrying 30% of it's total fuel capacity. Thus an F-35 equivalently loaded at 30% is 5,550 lbs. Using the F-18C as a metric, with 10,860 lbs of internal capacity. 60% of which is 6,516 lbs. The F-18C can carry 3x330 gal fuel tanks assuming a weight/gal of about 6.73 (what the weight from the F-16 comes out to be) the total fuel capacity is about 17,460 (I took 6,600 from the drop tanks, low balling in for the F-18C works against the F-35 in this instance). which gives 6,516 as about 37.32% of it's total internal capacity. 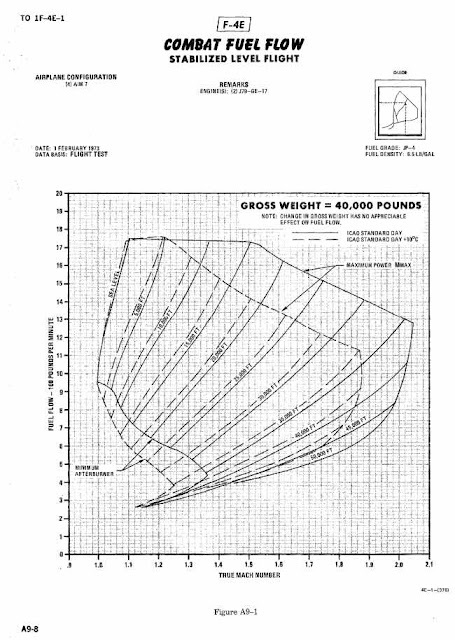 Which would mean the F-35's internal fuel load would be about 6,904 lbs. If any of these numbers are wrong, then I apologize. But I hope I may still get my point across. I feel this would be more accurate than just applying a 60% fuel load across the board (or an equal fuel loading) for weight comparison purposes given the same mission. Thank you for your time, and I hope you find this helpful. Why does any one bother to compare the F-4 with the F-35? Different decades to begin with, thus could not be a competitor to begin with. Thanks for the kind words first of all. My use of the 60% fuel weight was based upon what is believed to be the DoD's preferences and I didn't see any reason not to pick that as a starting point either. I didn't check your numbers, but they aren't really pertinent to the setting of the F-35's KPPs. I find 60% fuel an acceptable ground rule - and I'm certain DoD picked this using the same basic logic, was the relevance of 60% fuel to the F-35's combat effectiveness at a specific combat radius. 60% fuel load is a good value if you want to be able to engage the enemy for some period of time at the combat radius, have enough fuel to still get back to a point where you can be refueled (air or ground), and still a comfortable remaining fuel margin for safety when you land or hit a tanker.